The North East of England was known for being a spot for coal mining as it was available in abundance. It is no surprise, given the era and the working class background of Edward Cain, he went straight to the collieries after he left school. 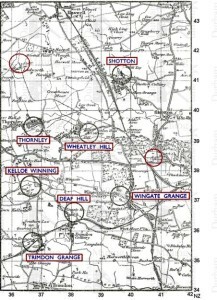 Map of Collieries, some of which Cain worked at. Labouring was a large part of Cain’s life and he goes into a lot of detail about the moving between collieries before he was old enough to work and also explains how much he didn’t want to work in the coal mines when he was finally old enough: ‘I wasn’t keen on starting work down the pit, and on the Sunday night I stood with my arms on the mantelpiece dreading the morning’ (pg 4). 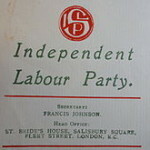 After his father was fired from the colliery, he and his brother had to move once again and so Cain took the matter to the union and became more aware of the activities of the Independent Labour Party. Cain’s brothers and father started working at separate collieries but eventually ended up working back at Wheatley Hill. It was after the passing of his father and sister that Edward Cain received the schooling and guidance to become a Deputy Overman and eventually he was elected Chairman of the Miner’s Lodge in 1922. Cain details the Miner’s Lockout in 1926 and how the miners were expected to work longer hours for less pay. Cain was part of the ‘special meeting’ that was called ‘to form various committees to cover the steady working of the whole system’ (pg 6). This was so that miners and their families were supported whilst the lockout was going on. Cain was actively against the employers’ excessive demands and lists the help of the community that came together to help get through this troubling time for a lot of workers. In Barron’s The 1926 Miners’ Lockout: Meanings of Community in the Durham Coalfield (2010) community spirit is seen as being an important factor for what got workers through the time, with schools becoming the centre of the community where free meals were given out to those who needed them. Gildart, Keith, ‘The Miner’s lockout in 1926 in Cumberland Coalfield’. Northern History, 44.2 (2007): 169-192. One Response to "Edward Cain (1891-1978): Life And Labour- Earlier Years"